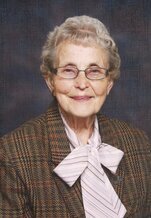 Ann Wood Obituary - Seaforth, Ontario | McGlynn Family Funeral Home Ltd.
"Somewhere, you will find a Legion kitchen"
Passed away peacefully at Seaforth Long Term Care Home on Wednesday, July 18, 2018. Born in Cookstown on March 7, 1929, Ann was in her 90th year. Predeceased by her husband Don “Chip” Wood in 2003. Beloved mother of Ralph (Dianne) Wood of Harpurhey and Dawn (Clayton) Riley of Kinburn. Loving grandmother of Stacey (Joe) St. Denis, James (Ang) Riley, Darcy Wood, Jasen (Christy) Wood, Brittany Wood, Janelle (Bryan) Hudgin, Katie (Anthony) deBoer, and 15 great-grandchildren. Dear sister of Joyce (Bruno) Braecker of Walton. Ann will also be missed by her siblings-in-law Geraldine Wilson, Ariel Wood, Annie Sallows, and her nieces, nephews and friends. In faith, we trust that Ann’s spirit is reunited in eternal life with Chip and their son Randy Wood (May 2018), her parents Harold and Alma (Gould) Wilson, her sisters Edna Wilson, Linda Wilson and her brother Ewart Wilson. For many years Ann was a familiar face on Seaforth’s Main Street as manager of the Triangle Discount Store. She also served our community in various ways through her dedication to the Seaforth Legion, Branch 156 and as a faithful member of Egmondville United Church. Visitation will be held at McGlynn Family Funeral Home, 87 Goderich St. W., Seaforth, 519-527-1390, on Sunday, July 22nd from 2-4 and 7-9 p.m. with a Legion Service at 6:30 p.m. A funeral service to celebrate Ann’s life will be held in the funeral home on Monday, July 23rd at 2 p.m. Interment will take place in Maitlandbank Cemetery followed by a reception at the Seaforth Legion, Branch 156, 123 Main St. S., Seaforth.